Record drawing of half of a ceiling showing a scalloped centre with radiating grotesque work, including two vases with putti as handles and foliage. At the bottom the border has part of a medallion garlands. 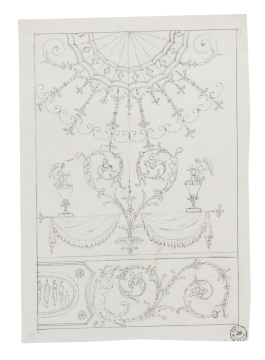 You are here: CollectionsOnline / Record drawing of half of a ceiling showing a scalloped centre with radiating grotesque work, including two vases with putti as handles and foliage. At the bottom the border has part of a medallion garlands. This composition is similar in form to that in Adam vol.26/28, and both resemble the drawings by Giuseppe Manocchi (c.1731-82) in the RIBA Drawings Collection (see J. Lever, ed., Catalogue of the Drawings Collection of the Royal Institute of British Architects, L-N, London, 1973, p.63). The RIBA drawings belong mostly to the period 1765-67 when Manocchi was in London. This drawing may belong to this period, and as such are the counterparts of the Manocchi drawings in Adam volumes 15 and 16 of c.1766, which are more developed compositions of the same sort. The drawing here may have been intended to be coloured.